Mayor Neil Grecian with the new Community Defibrillator located in the old telephone kiosk in Castle Street. 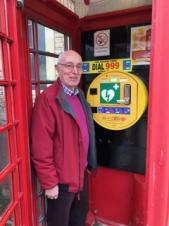 The Town Council have completed the installation of a defibrillator at the old telephone kiosk in Castle Street, Dursley. The Town Council was notified by BT in the summer of 2016 that the telephone was to be disconnected due to very low usage and the kiosk would subsequently be removed. The Town Councillors decided they wanted to keep the traditional red telephone kiosk and applied to adopt the kiosk from BT. The Town Mayor, Cllr Neil Grecian said "the town councillors wanted to preserve this part of our town's heritage and overwhelmingly agreed to adopt the kiosk." Following an online survey, the most popular alternative use for the telephone kiosk was to house a community defibrillator. With advice and support from the Community Heartbeat Trust, the Town Council successfully obtained funding for the purchase and installation of a defibrillator and security cabinet from the National Lottery's Award for All grant scheme. The defibrillator has now been registered with the Gloucestershire Ambulance Service NHS Trust and can now be used for emergency situations. The defibrillator will be available to the public 24 hours a day, seven days a week. You must dial 999 to obtain a code to access the defibrillator. Instructions are provided by the defibrillator during usage, but the Town Council will be arranging a briefing session for any members of the local community who would like learn more about using a defibrillator and what to do during a cardiac arrest. Cllr Grecian commented "the UK Resuscitation Council state if you are more than 5 minutes away from medical help then local initiatives such as community defibrillators are essential to aid recovery from a cardiac arrest. The disused telephone kiosk is excellently located within the town centre, minutes from the War Memorial Recreation Ground and the majority of the shops and businesses within the town".